Shopping for DC Comics Cards? Not happy with the hand you've been dealt? 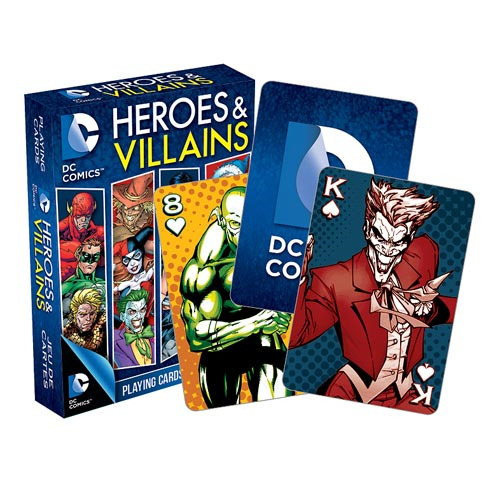 Stack the deck with these DC Comics Heroes and Villains Playing Cards! The DC Comics Heores and Villians Playing Cards features some heroes such as Superman, Batman, Flash, Aquaman, Green Lantern and many more. Villains that appear range from Joker, Lex Luthor, Captain Cold, Harley Quinn, Riddler, and many others! Each card measures approximately 2 1/2-inches x 3 1/2-inches with a linen type finish. These cards are great for professional players and fans! Ages 6 and up.